Background: Studies of the adverse effects of antidepressants tend to focus on biological symptoms. The prevalence of suicidality and withdrawal effects are currently a source of controversy. Objective: To directly ascertain the experiences of an international sample of antidepressant users. 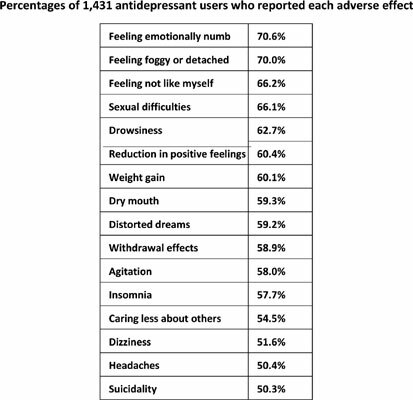 Methods: An online survey asked adult antidepressant users whether they had experienced 20 adverse effects ‘as a result of taking the antidepressant’, and if so, to what degree of severity. 1,431 people, from 38 countries, responded. Results: 61% of the respondents reported at least ten of the 20 adverse effects, most commonly: ‘Feeling emotionally numb’ (reported by 71%), ‘Feeling foggy or detached’ (70%); ‘Feeling not like myself’ (66%), ‘Sexual difficulties’ (66%), ‘Drowsiness’ (63%), and ‘Reduction in positive feelings’ (60%). ‘Suicidality’ as a result of the drugs was reported by 50%. Withdrawal effects were reported by 59%, and ‘Addiction’ by 40%. Rates of adverse effects were higher for those prescribed multiple antidepressants and those who also took antipsychotics. Younger age and longer use of ADs were positively related to total adverse effects. One third did not recall being told about any side effects by the prescriber. Less than 5% were told about suicidality, emotional numbing, withdrawal effects or addiction. Conclusion: Asking people directly reveals far higher rates of adverse responses to antidepressants than previously understood, especially in the emotional, psychological and interpersonal domains. Given recent findings that antidepressants are only marginally more effective than placebo, the findings of the current study imply a cost-benefit analysis that cannot justify the extremely high prescription rates for these drugs. Keywords: Adverse effects, antidepressants, depression, emotional numbing, side effects, suicidality, withdrawal effects. Keywords:Adverse effects, antidepressants, depression, emotional numbing, side effects, suicidality, withdrawal effects. Abstract:Background: Studies of the adverse effects of antidepressants tend to focus on biological symptoms. The prevalence of suicidality and withdrawal effects are currently a source of controversy. Will it Ever Become Possible to Prevent Dopaminergic Neuronal Degeneration?